"What you hold in your hands is an experiment. This IPA is spiked at bottling with Brettanomyces, a wild yeast that, over time, brings about charmingly unpredictable complexities of spice, funk, acidity, and more. The operative words in our beer-cellaring thesis are "over time." For those of you who are impatient or like to experiment, the earliest we recommend sampling this beer is 10.31.14. The beer won’t be fully carbonated until that date. Ideally, you’ll want to cellar the beer up to--or beyond--the Enjoy After date to help it reach its full evolutionary potential. At that point, some facets of the Brett characteristics will have mellowed, while others will have become more profound; it all matures into a fascinating and delicious culmination. Individual results will vary...and that’s both the beauty and the intent behind this beer." Pours to a hazy, light orange, effervescent body with a hefty three fingers of pillowy, white head. That Brett is just dominating the aroma and leaving little room for anything else. Strong tartness is present as is some lemon zest and a touch of sawdust. Not a lot here in terms of hops or bitterness as they are masked by the Brett. The nose had a nice acidic, tart component, but the tastes seems to not have retained it at all. It does have a faint sour quality, but the bacteria in this case didn't do as good of a job as it should have. Thankfully, the IPA qualities which were M.I.A. on the aroma have shown up a bit here on the taste. Lemongrass and classic West Coast garlic and onion are noticeable, but as they get to the back of the mouth, they turn into a mossy, wet grass flavor which isn't my cup of tea. All throughout, the bacteria and yeast cast a funky cloud over everything, but again, it's doesn't have the same pop as a lot of other beers with Brett. Mouthfeel is light, but I expected more carbonation. It drinks a little lighter than a 7% IPA, but some of the less-than-stellar Brett characteristics hinder it from being as enjoyable as it should be. 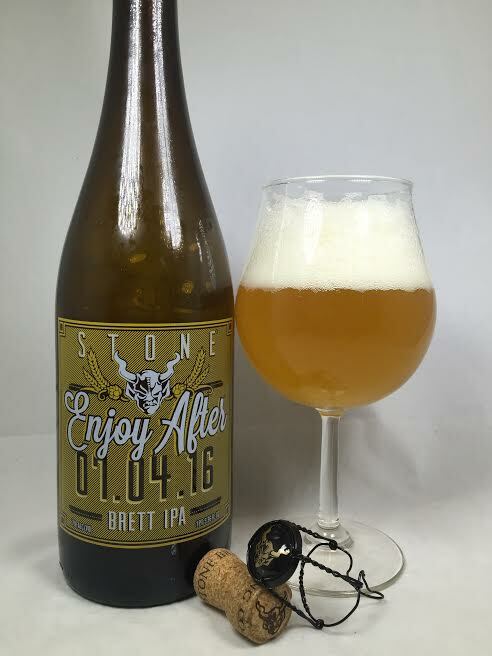 Overall, Enjoy After didn't merge Brettanomyces and IPA's into a perfect marriage. I think the base IPA itself isn't exactly a home run and the addition of the wild yeast didn't automatically bump the base beer up to another level. It was a nice experiment, but not executed all that well.